Apparently, it seems alike the month of January is the season for powerful open source Content Management System (CMS) goodies. After Over three years in development, the most popular open source Joomla CMS has hit the web development industry with its latest version Joomla 1.6 and announced the availability of version 1.6 to download. This new 6.1 version is the next generation of Joomla marks the beginning of a new era for Joomla developers and other web developers. An award-winning PHP based Joomla is freely available CMS which allow you to build websites with great ease of publishing content online. Joomla! 1.6 loaded with set of many important features to perform PSD to Joomla conversion and get high-performance website that make Joomla one of the most popular Open Source Content Management System in the world. The latest Joomla 1.6 version comes with loads of power packed under the hood in the form of user-friendly features, improved site control system, ease of use and great user-experience. The next generation of Joomla – the Joomla 1.6 come with numerous improvements such as unlimited category system, one-click extension update, CSS-based page layouts, multi-language functionality, internationalization, new access control system, granular control and permissions. You can say that the new version of Joomla – Joomla 1.6 packed with more power, more control, more flexibility, more speed and lots more options in comparison to old Joomla versions. This latest Joomla release aimed to provide power through simplicity in the form of new features to end-users, web designers, web developers and site administrators. 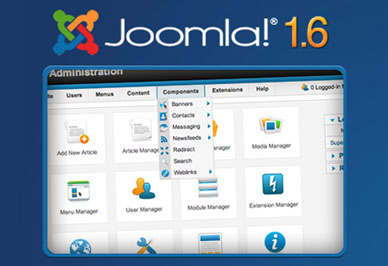 Joomla 1.6 provides new opportunities to integrate, customize or manage online content publishing of a web portal. With the release of Joomla version 1.6, the Joomla has become one of the most popular and powerful Open Source CMS streamlining entire workflow of design, integration, customization, implementation, development, deployment and updates much faster.